As always, demo was a huge job this year. We made some small adjustments to how we do total demo and flowering demo (we do flowering demo in every remnant now). Now, in our big plots, we only do a sample of the plants instead of total demo. Check out the updated table below (remember we did flowering demo everywhere). We still managed to shoot thousands of points, take even more demography records, and, as always, follow the colored flags! Evan and Will doing demo by the corn. While you might not be able to see the echinacea, we promise, it’s under there! So how do we do demo? When we find a new flowering Echinacea plant, we give it a tag and get its location with a survey-grade GPS (better than 6 cm precision). Then, we can revisit this plant for years to come and monitor its survival and reproduction. We’re monitoring over 10,000 plants as of 2018. This season we added 3868 demo records and about 1539 survey records to our database. After over 20 years of this method, we are starting to get a very good idea of the demography of echinacea in Solem Township. With this many records, organizing demap in the future is going to be a big task! Location: Roadsides, railroad rights of way, and nature preserves in and near Solem Township, Minnesota. Data collected: demo records include Flowering status, number of rosettes, number of heads, neighbors within a 12 cm radius of plants found. These are all taken with PDAs that sync with an MS Access database. They are all transferred to the demap R repository in bitbucket with git version control. GPS points shot: Points for each flowering plant this year shot mostly in SURV records, stored in surv.csv. Each location should be either associated with a loc from prior years or a point shot this year. You can find out more about the demographic census in the remnants and links to previous posts regarding it on the background page for this experiment. We’re wrapping up another week here at the Garden, but the excitement isn’t over yet! Tomorrow and Sunday at the Chicago Botanic Garden, members of Team Echinacea will be attending the Unearth Science festival. This festival is a great chance for everyone to see what all us scientists do at the Garden on a day-to-day basis. For her REU project, Brigid gathered data to study the relationship between flowering density and seed set. 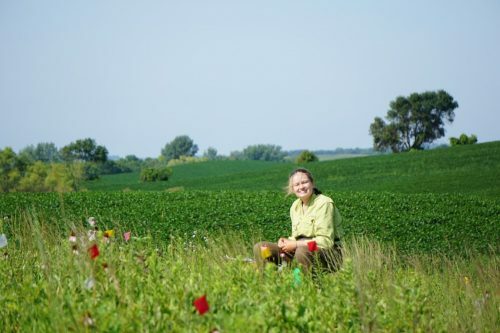 She worked at Staffanson Prairie Preserve, which appears to have higher flowering density in burn years than non-burn years. This year, 2018, was a burn year on the east side of the preserve. Brigid and Team Echinacea kept track of the style persistence of about ~150 individuals many of which we have phenology and style persistence information from prior years. These individuals were harvested and their achene count and seed set will be assessed by volunteers and interns at the CBG. Brigid also observed nearest neighbors for many of the plants that she tracked. It might be the cases that echinacea flowers are more successful if they have other flowering plants nearby. Synchrony is a large part of why fire is so important, and, since SPP is our largest remnant prairie, it’s the best place to test the relationship between fire and synchrony. Number of heads, phenology, and head size may also \ interact with fire — we’ll know once we look at the data! In 2018 only 19% of the plants flowered, despite it being a burn year. Is the 1996 finally showing its age? In 2018, 51 plants flowered of the surviving 269 plants in the 1996 cohort. That means that 41% of the original plants are surviving and 19% of the living individuals flowered. That’s up huge since last year, where only 2% flowered, and the year before where five percent of living individuals flowered. In contrast, however, 45% of living plants flowered in 2015, and 37%, 34%, and 40% flowered in 2014, 2013, and 2012 respectively. We found that of the original 646 individuals, 269 were alive in 2018, only 15 fewer than last year. We are not sure why so many more plants flowered this year. It’s probable that the fire in the plot in fall 2017 influenced flowering rates. The 1996 cohort has the oldest Echinacea plants in experimental plot 1; they are 22 years old. They are part of a common garden experiment designed to study differences in fitness and life history characteristics among remnant populations. Every year, members of Team Echinacea assess survival and measure plant growth and fitness traits including plant status (i.e. if it is flowering or basal), plant height, leaf count, and number of flowering heads. We harvest all flowering heads in the fall, count all achenes, and estimate seed set for each head in the lab. As yet, these heads are still waiting to be cleaned April 2019. We harvested 59 heads. At present, they await processing in the lab to find their achene count and seed set. You can find more information about the 1996 cohort and links to previous flog posts regarding this experiment at the background page for the experiment. 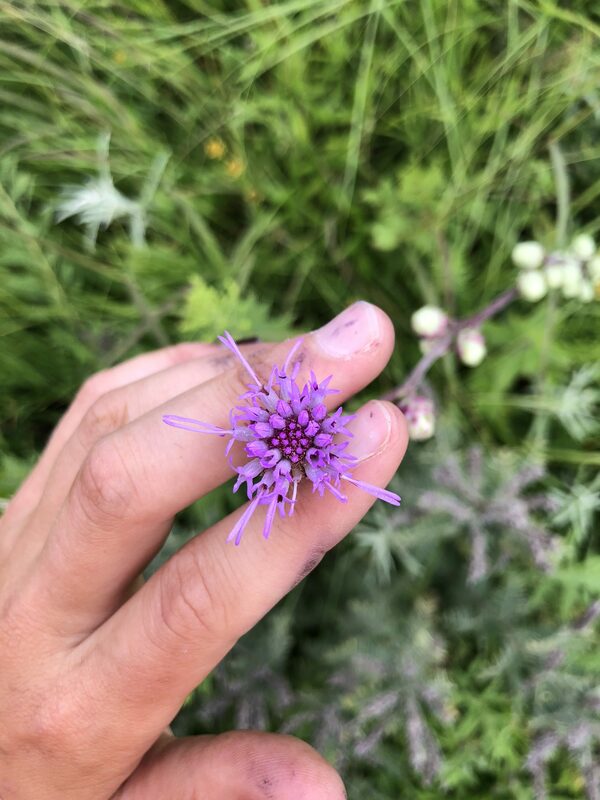 flowering phenology and reproductive success (seed set) for Liatris aspera and Solidago speciosa plants located along a transect at Staffanson Prairie Preserve. Staffanson is divided into east and west units. The west unit of Staffanson was burned Spring 2016. In 2016, Lea looked for differences in phenology and reproduction of east vs. west Liatris and Solidago plants. In 2017, neither unit was burned. In 2018, the east unit burned. Data collected this year combined with data collected in 2016 and 2017 will enable us to to see if burns influence phenology or reproduction. To assess phenology, Lea visited plants three times a week and recorded if they were flowering. She took GPS data for each plant included in the study. She also mapped the seven nearest neighbors of all flowering plants within her transect in 2018. Additionally, Lea visited all plants in the 2016 and 2017 datasets to see if they were still present and if they were flowering. 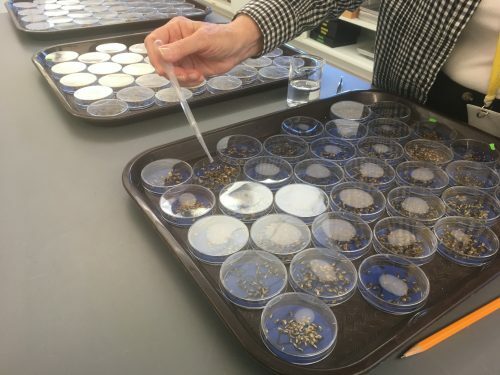 To assess reproduction (seed set), plants were harvested and brought back to the Chicago Botanic Garden so that seeds could be removed from the plant and x-rayed. 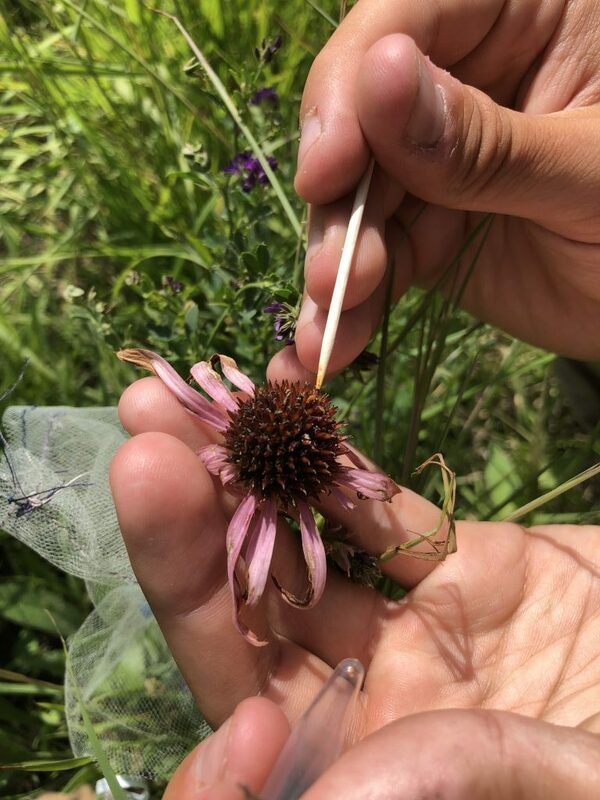 This study helps us understand how fire, phenology, and reproduction are linked in species that are related to Echinacea angustifolia. Data collected: Phenology data was taken on the visors every Monday, Wednesday, and Friday through the growing season. Paper harvest data sheets were used and brought back to CBG. 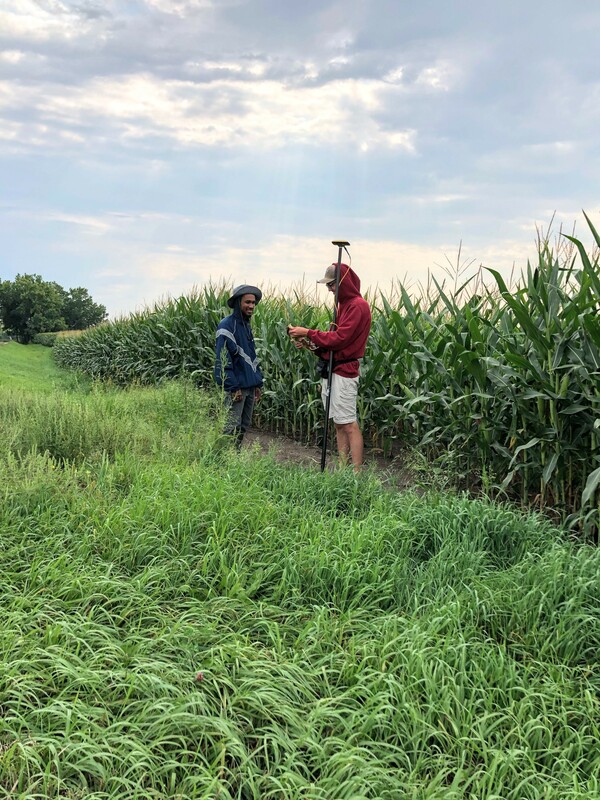 GPS points shot: ~543 GPS points were visited or shot, one point was visited for each plant monitored in summer 2016 and 2017, and points were shot for each plant in the 2018 dataset along with its seven nearest neighbors. Spring is here! The birds have returned and some plants are finally starting to poke up after a (seemingly) very long winter. Of course, you know what that means! It’s time to get planting! 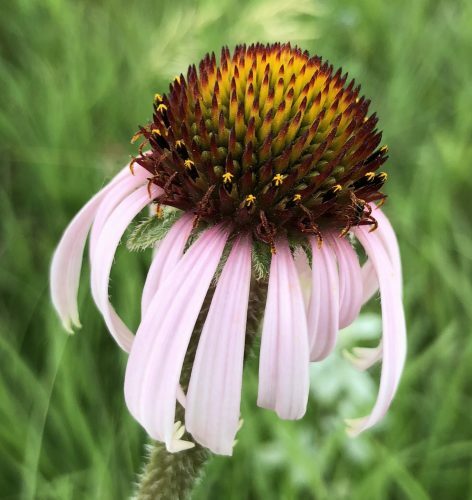 While many people will take this opportunity to begin growing their garden, here at the Echinacea Project we’re taking the opportunity to… well, grow more echinacea! We’ve taken this opportunity to do a small experiment on the shelf life of echinacea achenes. We’re germinating 54 heads total, exactly half of which are from 2016, and half from 2017. If their germination rates differ, we’ll being to get an understanding of how long these seeds are viable for. If they don’t differ, well then I guess echinacea achenes last a pretty long time. For right now, the achenes are going to spend two weeks in the refrigerator in low light to simulate their “winter.” I’m sure many people would also enjoy a 2-week, 40 degree winter. Expect updates on the growth of these seeds in about two weeks when we pull them out of the fridge and they begin to sprout! It will very exciting! Stayed tuned in to the flog this week for some exciting plugs for this weeks Unearth Festival! Michael adds pollen to one of the “addition” plants using a toothpick and a vial of collected pollen. Does receiving the maximum amount of pollination vs. no pollen at all affect a plant’s longevity or likelihood of flowering in subsequent years? Since 2012, we have been either adding or excluding pollen from the same plants’ heads to test what role pollen plays in ongoing survival and flowering. Unlike the previous two years, many plants in this experiment flowered this year, and analyzing them will likely reveal interesting results. This summer, 14 of the 26 plants remaining in the pollen addition and exclusion experiment flowered, for a total of 25 heads. This is the most heads the pollen addition and exclusion project has had since 2013. We continued experimental treatments on these flowering plants and recorded the survival and flowering status of all plants in the experiment. Of the original 38 plants in this experiment, 12 of the exclusion plants and 14 of the pollen addition plants are still alive. In this experiment, we assess the long-term effects of pollen addition and exclusion on plant fitness. In 2012 and 2013 we identified flowering E. angustifolia plants in experimental plot 1 and randomly assigned one of two treatments to each: pollen addition or pollen exclusion. When plants flower in subsequent years they receive the same treatment they were originally assigned. The increase in flowering rates this year will allow us to move forward with analyzing this data set, to potentially answer this 7-year question. Physical specimens: We harvested 25 flowering heads from this experiment that will be pulled from the normal ACE processing and pushed through faster. This is so we can more quickly determine achene count and proportion of full achenes. Data collected: Plants survival and flowering data was recorded as part of our annual surveys in P1 and can be found with the rest of the P1 data. Data on when heads had pollen added can be found in CGData/115_pollenLimitation, particularly dailyPollenAddition for the year 2018. 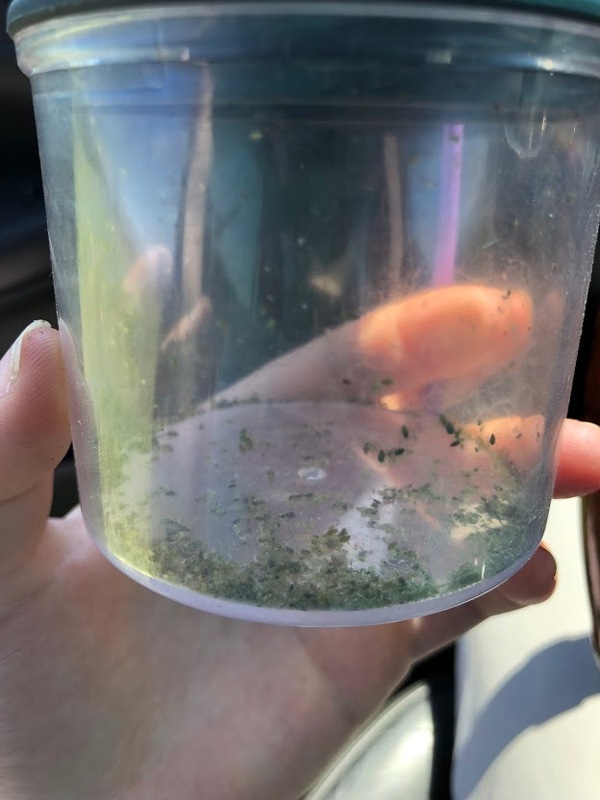 You can find more information about the pollen addition and exclusion experiment and links to previous flog posts regarding this experiment at the background page for the experiment. This summer Team Echinacea continued adding and excluding aphids to plants in the experiment that Katherine Muller started in 2011. Katherine Muller randomly designated a sample of 100 Echinacea plants in experimental plot 1 for either aphid addition or removal. Andy managed the project for the team in 2018, making sure that aphids were removed from the exclusion plants, and added to the addition plants. Twice a week, Andy (and occasionally Morgan) visited every plant in the study, recording the number of aphids, ants, and leaves infested. There remain 54 plants in the aphid study, 26 from the aphid addition plants and 28 from the exclusion plants. The data for this year will be added to the ongoing dataset. Aphis echinaceae is a specialist aphid that is found only on Echinacea angustifolia. Read more about this experiment. That’s a lot of aphids! Physical specimens: We harvested 25 flowering heads from this experiment that will be pulled from the normal ACE processing and pushed through faster. This is so we can more quickly determine achene counts and proportions of full achenes. Andy Hoyt’s poster presented at the Fall 2018 Research Symposium at Carleton College. You can read more about the aphid addition and exclusion experiment, as well as links to previous flog entries mentioning the experiment, on the background page for this experiment. In plant populations where reproduction is mate-limited, the potential exists for selection on floral traits through both male and female function (seed production and siring success). Selection could be strong because of high variation in both male and female fitness. Additionally, most plants rely on a number of generalist insect pollinators, each of which is likely imposing selection on plant traits associated with reproduction. In many plant species, these generalist pollinators are native solitary bees. However, pollination research mainly focuses on large social bees—bumblebees and the non-native honeybee. 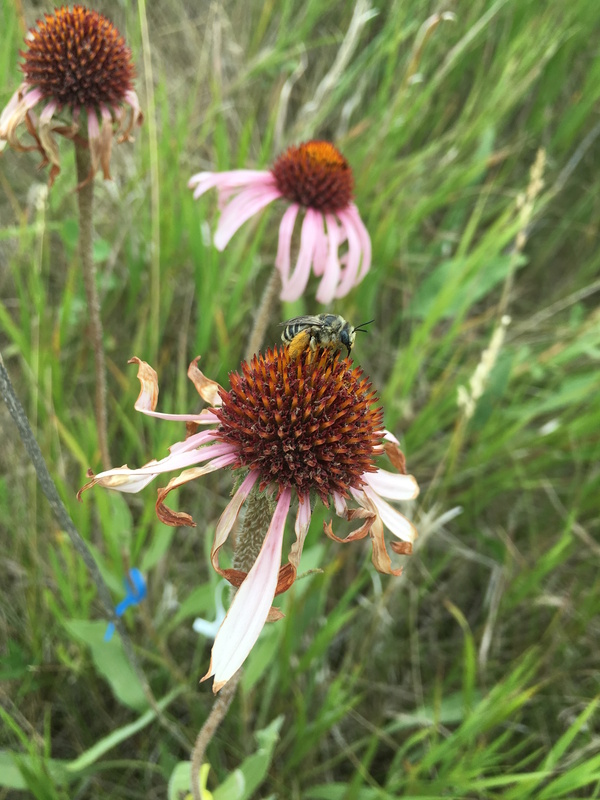 The main objective of this research project is to quantify how four generalist solitary bee taxa contribute to male and female fitness in the mate-limited prairie perennial, Echinacea angustifolia. 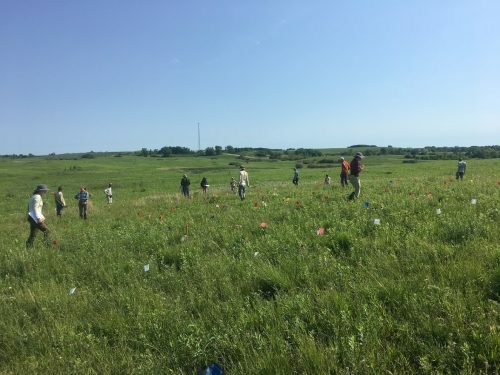 To accomplish this objective, 15 researchers worked together to monitor the complete pollinator visitation in a prairie community with over 200 flowering Echinacea individuals during five days in July 2018. 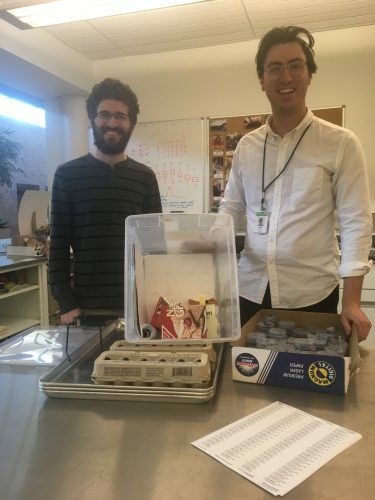 Through this effort, we recorded over 700 individual bee visits to a flowering Echinacea plant. To assess seed set, we removed achenes from Echinacea seedheads produced during the five observations day and xrayed the achenes for viable embryos. Currently, we are germinating the resulting seeds and taking leaf samples. This summer, we will extract DNA from the leaf samples and genotype each sample at 11 previously optimized Echinacea-specific microsatellite loci. We will use a full paternity maximum likelihood analysis to quantify siring success mediated by the different generalist bee taxa. Our results will advance our understanding of relationships between male, female, and total fitness in plant populations. Our results will also reveal how different pollinators may cause variation in fitness. These results can help us predict the effects of changing pollinator communities for fragmented plant populations.